I have a terrible confession to make. I can’t reliably distinguish between a Birmingham accent (“Brummie”) and a Black Country accent. Sorry, but that’s the truth. The West Midlands conurbation is based on Birmingham, and the area known as the Black Country is part of this conurbation. The second biggest place within the conurbation is Wolverhampton, but people don’t all agree whether Wolverhampton is part of the Black Country or not (the Wikipedia article thinks not). Everyone seems to agree that the centre of the Black Country is Dudley and that it includes Rowley Regis and Walsall. Everyone agrees that central Birmingham is NOT part of the Black Country. I’m aware of certain lexical and grammatical matters that are characteristic of the Black Country rather than of Birmingham or of the West Midlands in general. Under ‘lexical’ I include various traditional-dialect pronunciations such as ˈbæbi for baby (but I’ve heard that in Derbyshire too). I’ve never actually heard anyone say hɒnd for hand, which is also supposed to be typically Black Country. But jaʊ for you is notorious, though of course even people from the Black Country don’t always pronounce the pronoun that way. Nor do they always say jaʊm (‘yowm’) for you are. Here’s a clip of Adrian Chiles, which will enable you to hear his ‘Black Country tones’. Here’s another, longer, one with Adrian Chiles and Frank Skinner, both Black Country lads. And for comparison, here’s one of Jasper Carrott, who for the letter writer is a representative Brummie. None of these broadcasters seem to use the characteristic high-rise-level declarative intonation pattern that I hear from some Birmingham people (the “Brummie whine”). The best phonetic description that I know of is Anna Grethe Mathisen’s article on Sandwell in Urban Voices (ed. Foulkes and Docherty, 1999, Arnold). The very first words in this article, however, are far from helpful in enabling us to distinguish between the two varieties. 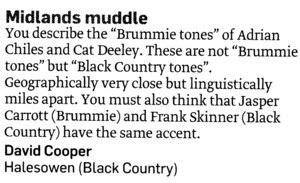 For someone from Halesowen, like the writer of the letter quoted, it is no doubt true that the Brummie and Black Country accents are “linguistically miles apart”. But not for the rest of us. Help! Is there any phonetician who can pin down for us just what it is that the locals latch onto in recognizing the distinction? I have read Chinn and Thorne's "Proper Brummie: a dictionary of Birmingham words and phrases" (2002) [but don't own a copy]. I recall that it said that -ong words (long, song, wrong, etc.) are pronounced traditionally with /ʊ/ in the Black Country whereas Birmingham has the more common /ɒ/. Does anyone know if this is still the case? You often find in Britain that people exaggerate local distinctions, or that people say that there's a clear difference between two towns and then cannot specify what it is. Some people swear that there's a difference between Leeds and Bradford, but I can't tell any (comparing like-for-like speakers). I've just looked at this site for the Black Country. I'm surprised to see re-spellings of -ing suffices as -en. This suggests to me [ən] whereas I would expect [ɪŋɡ] for this part of the world. Adrian Chiles and Frank Skinner don't speak as described on that website, so it probably represents old-fashioned Black Country speech. I know what John means; locals insist that there's a difference between the two but I've never managed to pin down what the differences are. Maybe it's purely a matter of intonation rather than phonetics? However, I've noticed an unrounded LOT vowel (that is, [ɑ]) in some Brummies, which seems like a local innovation. Could this be one of the differences? "However, I've noticed an unrounded LOT vowel (that is, [ɑ]) in some Brummies, which seems like a local innovation. Could this be one of the differences?" Well, they do mention that here for Birmingham. But jaʊ for you is notorious, though of course even people from the Black Country don’t always pronounce the pronoun that way. I had a colleague at (secondary|high) school named Julian, hailing from Stourbridge. He was generally referred to as /'dʒaʊli.ən/. Children are cruel. I've had a read through the relevant chapter in Handbook of Varities of English, and it had several suggestions. This was written by Urszula Clark. The point that I mentioned in my first post (about -ong words) is on page 144, although I forgot that the /ʊ/ can also occur in west Birmingham. It says on page 148 that there is a difference in the FACE vowel, with Birmingham speakers' using [ʌɪ] and Black Country speakers' using [æɪ] (alongside [ɛɪ] in both cases). This is described as "one of the few variables for which there appears to be a consistent difference between the Black Country and Birmingham conurbations." Pages 145-6: older Birmingham speakers are more likely to separate BATH from TRAP. It seems likely that the isogloss passed through the conurbation in the past but has moved south of it as the short form in BATH has eliminated its rival. No vowel causes conflict quite like the BATH vowel! Page 151: Black Country speakers have [ɪʊ] rather than [juː] in GOOSE words with a yod. That should be enough to satisfy Black Country people of their sovereignty. "It says on page 148 that there is a difference in the FACE vowel, with Birmingham speakers' using [ʌɪ] and Black Country speakers' using [æɪ]..."
Did they really write [ʌɪ]? Is [ʌɪ] being used here to mean [ɐɪ], as in Accents of English? That would make more sense to me. Because [ʌɪ] sounds way too broad, even for a Brummie accent. It sounds like nothing I've ever heard for FACE, in fact. I did a study of BC dialect a number of years ago. Events may have moved on, but (also having a number of BC relatives), I'd have to challenge the 'you' pronunciation. I suspect jaʊm is a cartoon version by outsiders; most of my sample and informal contacts at that time (early mid 80's) were saying jəʊm. Of course Brummies call BCers Yam-yams which is allegedly a skit on the 'yo-am' thing, which may further indicate its a 'way you hear it' thing and would indicate that this is a distinctive of BC speech. So has the pronunciation changed in 20 or 30 years. It could have done, but I still don't hear the few BC speakers I hear nowadays saying jaʊm. I think that the central vowel may be a little lower than the schwa but not into /a/ territory. @yuriive: Yes, it does say that and is in square brackets. I think that she must mean that, as she uses the symbol ɐ when discussing the CURE and lettER vowels, but there is no need to use ʌ in any other set for the West Midlands. I can't speak for Urszula Clark though. Perhaps she would reply to an e-mail from you. She's still doing research on the Black Country's dialect. @ Ed: Thanks for your reply. I'm just amazed by how wide the diphthong used for FACE is in this accent, that's all. Was up there at the weekend, and lived there for fifteen years. Stayed with a pair of friends, one a brummie, the other from walsall - the first used a slightly wide lip placement on [ɜː] words, the other rounded. The main thing I notice is a very different tonal quality - Brummies tend to be twangier and more trebley in tone, possibly why a lot of people mistake strong brummie for london - my old mate from Halesowen, and most of the yam-yams I know have a heavier, darker tone. Is there also something in the 'trap/bath' split that might indicate one or the other? My memory of giving pronunciation notes to West Midlanders is that BC'ers were more likely to have [pæθ] and [ɡɹæs] than Brummies. I am of course only referring to the caucasian accent here - MBE is a totally different fish! As a Blackcountryman of Sedgley, I think David Cooper of Halesowen is unsuccessful in the valid pursuit of attempting to illustrate the difference between Black Country and Birmingham phonetics, because both Frank Skinner (born Oldbury, Sandwell) and Adrian Chiles (born Quinton, Birmingham) originate from the Black Country's easternmost fringe (and arguably beyond it), where the pull of Birmingham is strongest. To me, both sound like "Brummies". However, no other Black Country "celebrities" can demonstrate the point any better. Instead, for anyone with 28 mins and an ignited interest, youtube hosts 'House of Friends', a Philip Donnellan documentary filmed in the Turk's Head public house in Brierley Hill for his controversial BBC2 series Landmarks in 1964. While the relative dearth of research interest in the Black Country (apart from Urszula Clark recent work and forthcoming project, and Esther Asprey's 2007 PhD thesis from Leeds) means that very little modern-day data exists to show how far and where this distinctive speech has been retained, it is nonetheless a fascinating piece. Thoughts? My experience (which would be mostly with younger speakers) is that Brummies do not have the trap/bath split, except that they do tend to have the long vowel in "laugh" and "aunt". I also don't believe that that [ʌɪ] transcription for FACE represents a real back vowel: if it did wouldn't it sound rather like West Country PRICE and so be likely to be caricatured as CHOICE? I know theres differences between west brom and hampstead speech and brummie speech and dudley speech. It could be a worcestershire and staffordshire and warwickshire thing. West brom and smethwick were proper staffs, dudley had more worcestershire so say yowm whereas I say yo'm pronounced yum and quickly yam. Yammer also means to speak quickly and loud, brummies are one tone, dudley is quite low, brummies came across smethwick, west brom speakers etc first. My nephews are from west brom, one of their partners is from hampstead and uses BC phrases not brummie ones. Brummies dont have a dialect its just how they pronounce it, e.g. citays and also oi for I. West brom snd smethwick speech say coherd for code schoolwerl for school etc in long vowels but uses yo, ya, ta, tarra, ay, which suggest old dialect rural speech as well as mek as I use mekkin the bed, some have common features like missing letters out in bothe speeches alf for half. I use doe for dont, but not cor or dae although I grew up in a later era when there was less broad speech however my mom says jus my barra not used in birmingham for just the way I like it and yampy and she was from bearwood, but we use most common BC words and phrases. Cor and wor may be more dudley/worcestershirewhere more so called traditionalists think theres a standard speech and there wasnt one. We speak more like Walsall Noddy Holder. I looked at staffs dialect and couldnt see wor or cor but I might have missed it. But we do use a at the end instead of er winda, mucka, gaffa, gunna, wanna. Use gob, bobowler for moth, collywobbles, wooden 'ill for stairs. As a smethwickian who has never and never been a brummie, from people talking on the subject who have never been near the place or come from outside to think they know its rubbish, we eat faggots in smethwick and say kidda and use terms not said in birmingham, I would suggest as we say yo'm not yow'm its from this and living next to birmingham and going to market as my grandad did brummies got yam yam from yum yum would sound yam yam but now it seems everyone is jumping on the yam yam title, by the way neither smethwick, oldbury or quinton were ever the borough of birmingham which is where brummies come from, not even sutton coldfield or northfield are brummies either, birmingham expanded rapidly to cover more areas. Its even more offensive to call all people who have never considered themselves brummies to be brummies just because they live by it, russia is next to finland you wouldnt call a finn russian! Wednesbury is less than 5 miles from Dudley. Birmingham is more than 20 miles from Coventry. Ive never been to bilston or darlaston as we stick to the north east and east south staff former areas no idea why, although I have been and worked in dudley but mainly keep to the east of it mainly castlegate, centres of wednesbury and walsall, blackheath, rowley and cradley heath ( which are all in sandwell anyway) as my brother lives, halesowen a little the centre and mucklows hill there but thats about it. It might be an family, historical thing. I have no actual brummie relatives and dont go near it unless working. I spent my first 8 years in Willenhall and the next 8 in Oldbury. Most of my family originated in Willenhall and Blackheath so I am pretty familiar with several very different parts of the Black Country. I also married a Brummie from Harbourne/Quinton borders. There are quite a few variations in the Black Country accent and I agree there is a massive difference between Black Country and Brummie. Basically the verb "to be" is I am (or I'm), We am (or Wi'm), You am (or You'm or Yo am, or Yoam or Yam), They am (or Thay'm) are the Black Country variations that Brummies never say. It would be a perfectly legitimate sentance in Black Country to say "Yo'am saft yo am" or "Yam saft yo am" which would mean "You're silly you are". You often hear an actor playing a brummie say Yoam or Yo, but you would never a real brummie say that naturally. Similarly with other black country only forms of verbs negative/positive variations are as follows: I can (or I con), I car (or I cor) , I shall, I shar (or I shor), I will, I wow, I did, I day. I'd say that the Willenhall/Wolverhampton variations tend to be with an o. i.e. I cor goo dahn the Wolves this wik cos I cor afford a ticket or I car gu dahn the Albion this wik cos I car afford a ticket. Dahn (down) is another typically black country word that brummies would never say. There must be thaaarsands of words that Black Country folk say differently. Brummie is generally much closer to grammatically correct english words and sentances but usually with a very nasal sound. My wife (a brummie) spent a year living in Cradley Heath which has a very, very strong Black Country dialect accent and she struggled to understand the locals despite having grown up only a few miles away. To say the Black Country and Brummie accents are virtually the same is totally wrong. How do people in Stoke area say 'butcher' and 'cushion'? Is it short in some Midlands accents?